NATEK is glad to announce the launch of our new services – Quality Assurance. Thanks to our unique QA Services offer and transaction model our clients can better plan their budget while receiving the highest level of services. 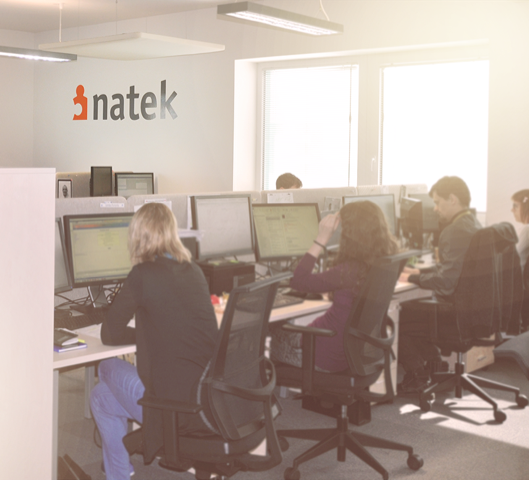 As part of our continuous effort to provide our customers with the most comprehensive service, in our Delivery Center in Cracow, Poland we are launching our new NATEK QA Services. It will extend the service we offer to our clients. We design, develop and execute test plans. We offer functional tests including acceptance testing, regression testing and integration testing as well as non-functional testing – performance testing and load testing. Moreover, we can provide any other testing types based on project requirements. We focus on two types of applications: web applications (including web services) and mobile applications. NATEK proposes a unique offer. As a matter of fact, for the first time in Central Europe IT development departments can order a number of developed test cases and be invoiced basing purely on the delivery. There is no need of team management and HR activities. Partners can manage the variability of their testing steps according to their web or mobile application development cycle. NATEK allows their partners to concentrate on the core development product and certify the quality delivery by our senior experts. Thanks to our knowledge of all main QA tools, NATEK developed its own solution which is able to test simultaneously in real-time the web and mobile application. That decreases the time-to-market of clients’ products. We save our partners’ time, handle the quality of the final product and decrease the project costs with full flexibility. Why outsource your QA processes? QA is crucial in developing and launching a successful product. Having the process outsourced and freeing the internal resources speeds up the whole delivery. It also allows the customers to focus on their core activities. Contact us to discuss your needs and what we can offer you. Whatever you are doing, our QA specialists can assist you by performing automated tests on your schedule. If you need a trustworthy partner for your project or you have any questions regarding our new offer contact directly QA Project Manager Piotr Bogusz at piotr.bogusz@natek.pl or Sales Manager Romain Rebour romain.rebour@natek.pl.